My previous journals usually took me an afternoon to write at the end of the week because I had all week to write them, but this one is different. I’ve been thinking of what to write in this journal for quite some time. I wanted my final journal post to be my best one. Yes, this is the last journal by Rob, although I am toying with the idea of starting my own blog. I appreciate everyone who read this journal on a regular basis and everyone who just stumbled upon this now. It is my last week here at Rock Hills Ranch. I’m closing a chapter in my life and beginning to write a new one starting next week. I’ll be moving to south central South Dakota to chase my lifelong dream of being a working cowboy. I’ve been slowly wrapping up projects around here and packing my belongings in preparation of leaving this special place. Other interns have made a summary of the activities they did over the summer as a final journal, some have been philosophical and I do believe I’m going to lean towards the latter but throw some stories in there too. Theodor Geisel has always been a favorite author of mine. If you are thinking, “who is that guy,” you may recognize his books like Green Eggs and Ham, The Cat In The Hat, Horton Hears a Who. Yes, Dr. Seuss is one of my all time favorite authors. Maybe it’s because he and I share a birthday, or the fact that the first book that I could read by myself was one of his. Either way, I have an entire collection of quotes that are attributed to him. I spent a lot of time deciding on what quote to use in this journal and I concluded that the following would be an excellent choice. If you had told me on February 13th that I would meet Lyle Perman and begin my internship adventure I would have laughed. I did research on RHR before my Skype interview with Luke that afternoon and I realized that if I was fortunate enough to intern in Lowry, I was going to a great place. The Permans are a wonderful family to call your friends, mentors and bosses; and the community of Lowry opened their arms wide for me and made me feel welcome. The land here is absolutely outstanding in my opinion. 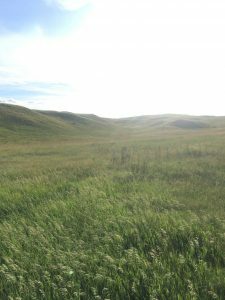 The rolling hills, the steep rocky hillsides and the wide valleys, the grass that reaches my stirrups in June and July; historical places such as old wagon ruts, homestead shacks; the creeks with trees and the flats where we cut so many bales of hay. If you take away some of the barbed wire fences on the land, it’s like we stepped right into the late 1800s and early 1900s. Some days at Rock Hills Ranch were tough. Like the day this spring when Luke and I did everything we could to attempt to save a calf’s life. The day that I was building a new fence and the wire cut my arm and I rushed to Garnet’s mud room so she could help me stop the bleeding and bandage it up. I remember Luke telling the local kid who picks up odd and end jobs that tomorrow is a new day after he had troubles with a lawnmower. I had some of those days too. But I remember that each day is what you make it. I remember when I was cutting hay just east of Luke and Naomi’s house and I texted him asking if he could come help me change a sickle section or guard as I had to use the big wrench to turn the machine to line up all the holes on the opposite end. Luke came after helping put the kids to bed and helped me, we talked a few more minutes and I remember as I was climbing back into the tractor to keep cutting he called out “Hey Rob, good job at bouncing back after a rough start to the week.” I made that week my week. My long-term goal is to have my own ranch, my own cows, a string of good saddle horses, and be able to use all of those to support a family. That’s a mountain of a goal to climb and with the way the world is turning, that’s a HUGE mountain. I know that there are better cowboys out there than me. There are men and women who will forget more than I will learn. I also want to do things the old-fashioned cowboy way; no 4 wheelers, no auto-steer on my haying equipment. I want to do things with just myself, my kids and wife when they are able to help, my horse and my dogs and some good friends. Being a cowboy is a dying art. I also am going to start climbing the mountain of being a voice for modern day cowboys. People don’t always understand why we do things and critics will always let you know when they think you are doing something wrong. It’s a mountain, but I’ve got some good sturdy boots and a sure-footed horse to help me climb to the top. So here I am; ending almost 5 months of learning. My new adventure starts in October. My clothes fill up the back seat of my car, my saddle rides in my trunk, a bottle of water in my cup holder since I gave up soda (or pop). I am definitely going to miss this place, but Luke, Naomi, Lyle and Garnet have taught me so much and it’s time to take what I learned and apply it in a job. It’s time for me to get on my way. I owe the Permans a huge thank you. They not only gave me a chance to work, but they were mentors to a lost young man. They helped me sort out some things in my life, taught me some new skills and became some great friends. Wherever I end up building my ranch, you guys are always welcome there. God gave me a once in a lifetime opportunity here, and I wouldn’t trade it for the world. I look forward to when their trail and mine cross again. I also hope that I can meet some of you readers as well. And for one last time as Rob Foiles, Rock Hills Ranch Intern…. The future belongs to those who are still willing to get their hands dirty. Are You Wasting, or Building? The s un comes up later in the morning and sets earlier in the evening, there are a few deciduous whose leaves are turning from green to the numerous colors they transition to. I’ve started wearing silk neck scarves in the morning and evenings when I’m working and sweaters and my hooded sweatshirt tag along with me everywhere. If you sum up what I just said, you can conclude that fall is coming. 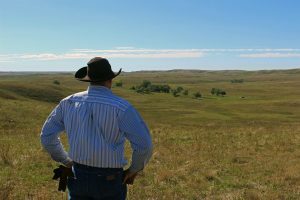 Another sign that fall is approaching, would be the South Dakota Grazing School put on by the Grassland Coalition. Before I get any farther I just want to make sure I say thank you to the Perman family for encouraging me to go. I could write an entire journal just about the grazing school and my experiences and what I took away from it. The students-when I think of school, I think kids but I can’t call people with gray hair kids can I?- were broken up into 5 predetermined groups that we worked with and discussed workshops with. One pupil stated that he had been approached by a neighbor who said he was wasting grass by implementing a rotational grazing system. Another student then said “are you wasting grass, or are you building land”? And that statement got me to thinking. Could you smell the smoke last week? Don’t worry; it was just the gears in my head burning the cobwebs out. In a previous journal, I explained a “take half leave half” method of grass management taught to me by Dr. Smart during my time at South Dakota State University. I’ve learned that roughly a third to half of the root mass of a plant dies every year, and that that dead plant material is what becomes what we call organic matter in the soil. We need to leave some plant material above the ground so that the leaves can catch sunlight and develop new roots. So the rest of this journal I’m going to give you the 22-year-old explanation of why I think that the statement is right on point. The New York Times wrote an article in 2002 about how the United States loses 2 acres of farm ground per minute due to urban sprawl. The trend lately has been that when a farmer wants more farm ground or loses some due to things like that, they find new ground to raise corn and beans on that shouldn’t raise corn and beans and other crops. I have personally witnessed the lost of almost 200 acres of grass when a neighbor burned a pasture, then broke it (used a tillage tool to break the sod and expose black dirt for cultivation). I wasn’t a math major in college, but I know that we lose a lot of land everyday and that there is something scary about losing that land. There isn’t any more land being created. As a young man who wants to become the best land manager that he can, I know that I have to do everything I can to preserve the land I will operate on. My passion will always be horses and cattle, and they need grass. And as long as I need grass, I’m going to leave some. Everyone who manages land needs to keep conservation in the back of his or her mind. Whether they leave the grass for plant vigor and building land, wildlife habitat, or they want cover to catch snow, we need to all help conserve the land. Conservation is how we are going to ensure that my generation and generations to come will get their chance to live off the land.